I've used yogurt with savory chicken recipes and it never really occurred to me that I could use it on fish as well. The yogurt mixture used on the salmon was easy to combine and use. I imagine it would be delicious on other types of fish like cod, tilapia or even mahi mahi. 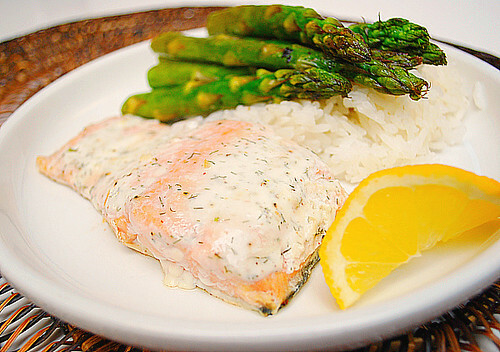 I served the salmon with roasted asparagus over a bed of rice and it was perfect for a weeknight meal. Preheat oven to 450 degrees. Combine yogurt, mustard, dill, and garlic powder; season with salt and pepper. Place salmon, skin side down, on a rimmed baking sheet. Spread yogurt mixture on salmon. Roast until opaque throughout, 7-8 minutes. Serve warm or at room temperature with lemon wedges. I also just recently learned how good it is to bake fish in a yogurt sauce! I've been making a feta-yogurt-dill mixture that I use on tilapia and I'd love to try it on salmon too.